When shopping for a drone, you’ll probably come across a number of different terms and phrases that, if you haven’t owned a drone before, may seem a little confusing. The first thing to be aware of, is that a drone can come in a number of different states, often labelled ARF, BNF and RTF. These are used to describe how the drone comes, what it comes with and whether or not you need any extra components. In this article we’ll be taking a look at the difference between ARF, BNF & RTF drones, hopefully allowing you to establish which one is right for you. 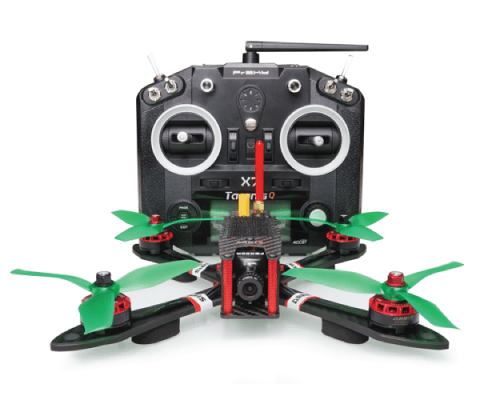 What is a RTF Drone? RTF stands for ready-to-fly, meaning that the drone comes fully constructed, alongside all the components and equipment needed to get the aircraft and up and flying. This is often best for beginners who have never owned a drone before, and therefore have no drone equipment such as a controller. RTF drones tend to be more expensive than other types of drones as they usually have more components included in or with the drone, meaning it often has a higher price tag. Pictured below is an example of an RTF drone kit. As you can see, the drone is fully built and comes with a transmitter. 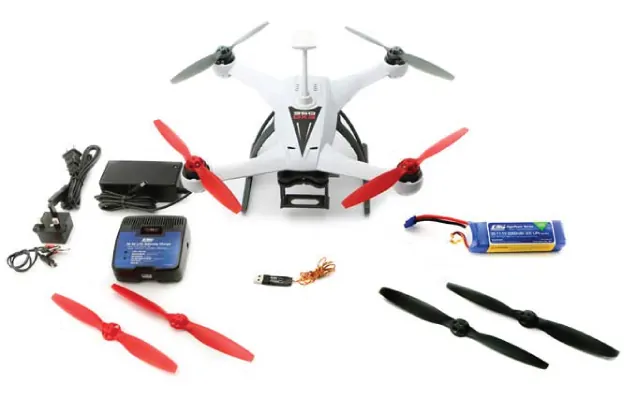 This is the bare minimum you’ll get with an RTF drone, as some companies offer a additional accessories such as spare batteries or a FPV screen. What is a BNF Drone? BNF stands for Bind-and-Fly, and requires you to have your own transmitter, which you then bind to the drone yourself. Not coming with a transmitter often makes BNF drones cheaper and therefore more attractive to hobbyists who already own a transmitter compatible with the drone. The only issue with BNF drones is that your transmitter has to be compatible with the receiver built into the drone. If you’re transmitter isn’t compatible, you’ll have to buy the RTF version or see if it is possible to change the receiver on the drone. It’s also worth noting that not all transmitters are the same an often can be broken down into two categories – toy and hobby grade. Hobby grade transmitters are far superior to toy grade as they usually come with a number of different buttons that can be used for a wider array of controls. Above is an example of a BNF drone kit. As you can see, the drone comes with everything you need to fly, except for the transmitter. What is a PNP Drone? PNP stands for Plug-and-Play and is also known as PNF (Plug-and-Fly). This is where the drone comes fully assembled without the radio system i.e. the receiver and transmitter. This is probably the least common type of kit, as it requires you to already have two components that can be used with the drone. Having said that, it does provide you the freedom to use your own receiver and transmitter, which can allow you to have a longer range than with the RTF package. As you can see from the above image, the drone comes with pretty much everything you need other than a transmitter and a receiver. 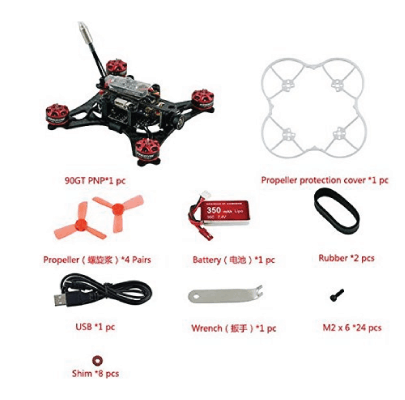 These types of drones are usually much cheaper than RTF and BNF drones as they come with less components. What is an ARF Drone? ARF stands for Almost-Ready-to-Fly and means that the drone will come disassembled and need to be constructed manually, often with additional components being required. 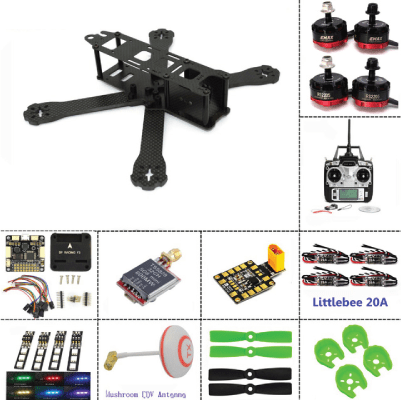 These drone kits are definitely for people wanting to take a DIY approach to their drones. I would really only recommend doing this if you have some drone experience and are familiar with the different components of a drone. Typically, high speed racing drones are built as ARF kits, as this allows for a fair amount of customisation, allowing pilots to achieve a higher speed. Above is an example ARF drone kit from LHI. As you can see, the drone comes pretty much fully deconstructed and requires assembling. As I mentioned earlier, this isn’t really suitable for those of you who haven’t flown before, as the last thing you want is to spend hours building a drone only to crash it in the first flight. So, What Should You Chose? There really is no right or wrong here, as it’s down to personal preference. If you’re unsure, check out the table below that should hopefully give you some guidance. Drone enthusiasts with prior flying experience (DIY experience handy as well). I would also recommend checking out this awesome video below by Short Circuit RC. The video walks you through the different types of drones and what to expect from each one. I think I’ve covered the differences between RTF, BNF, PNP and ARF drones. If you’ve got any questions what so ever, please feel free to drop a comment in the section below. Previous PostDJI announces event in NY: 'Because life is big!' Nov 28th. Phantom 5?